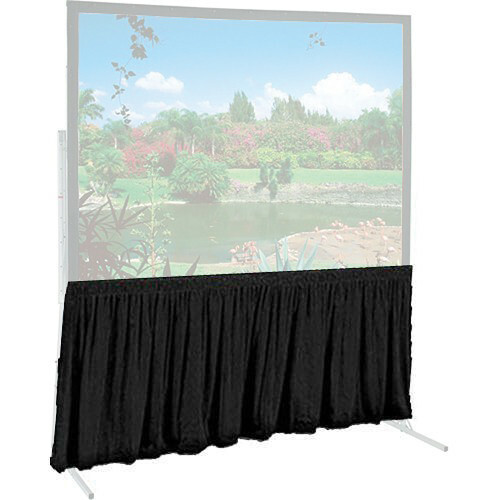 The Draper 176 x 176" Dress Skirt (European Format) gives your show a more professional look by creating an attractive border on the bottom edge of your screen. IFR Velour is washable, and requires no retreating. It is fire retardant for the life of the material. It is 15% lighter than standard velour. Note: This skirt is specifically designed to fit European format screens. Euro skirts will NOT fit conventional domestic screen sizes and formats. Neither will domestic skirt bars fit European skirts (and vice versa). How does this fold up and does it have wheels? This is just the skirt. It is for a folding system like the one featured below. A wheeled case is included. Note: This skirt is specifically designed to fit European format screens. Euro skirts will NOT fit conventional domestic screen sizes and formats. Neither will domestic skirt bars fit European skirts (and vice versa).